ANAHEIM, Calif. — At the Disneyland Resort in Anaheim, California, leisure and business travelers will find three Disney Hotel properties, each with a distinctive style: the luxurious surroundings and California Craftsman architecture of Disney’s Grand Californian Hotel & Spa, the classic Disney magic and recently renovated charm of the Disneyland Hotel, and the sunny California beachfront theme at Disney’s Paradise Pier Hotel. Offering 2,452 guestrooms, suites and villas, and a variety of accommodations, surroundings and amenities, all three hotels feature the famous Disney touch for quality, service and hospitality. As part of the Disneyland Resort, these hotels are just steps away from the eclectic mix of dining, entertainment and recreational features of the Downtown Disney District. 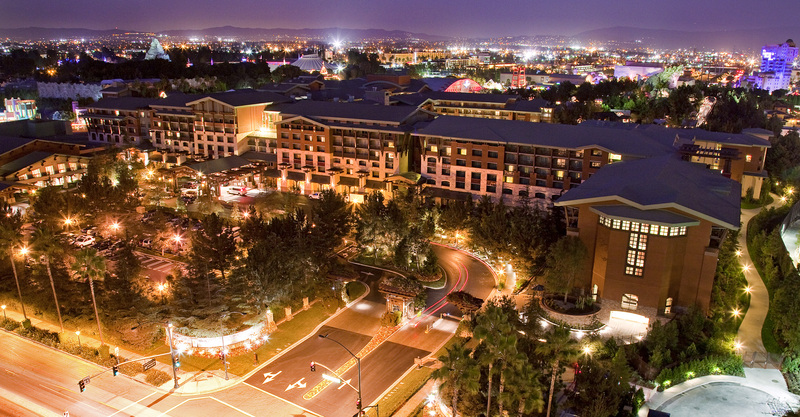 Of course, Disneyland and Disney California Adventure Parks are just a short walk away from any of the Disney hotels. The reimagined Disneyland Hotel creates a fun, family destination that pays tribute to the early days of Disneyland, complete with 973 remodeled rooms and re-themed towers that feature an energy-efficient sky-blue reflective glass exterior. The Fantasy Tower lobby showcases Mary Blair artwork, creating an instant connection to “it’s a small world.” The Frontier Tower features a scale model of Big Thunder Mountain Railroad in the lobby. At the Adventure Tower, guests will see Jungle Cruise characters incorporated into the design. Guests of all ages will enjoy an immersive water play area and courtyard. With a nod to the iconic original park signage, a replica of the original Mark 1 Monorail Car sits at the entrance of two water slides, paying tribute to nostalgic Disneyland. No tickets are required at the new D-Ticket and E-ticket pools, which draw their names from the iconic ticket books that were used in the early days of Disneyland to experience attractions. The area also features a Minnie Mouse-themed outdoor spa. In addition, six new cabanas are available; each features a flat screen TV, refrigerator, safe, phone, and ceiling fan. The new courtyard also has added two iconic dining locations. Tangaroa Terrace features Island-inspired fare for breakfast, lunch and dinner. Guests use an innovative, easy-to-use touch screen to select menu items, which are prepared to order and delivered to their tables either inside or on the large outdoor patio. Trader Sam’s – Enchanted Tiki Bar, named after Trader Sam, Disney’s Jungle Cruise “Head” Salesman, features interactive special effects blended with classic Disney storytelling. Trader Sam’s serves a mix of creative appetizers and signature cocktails like the “Uh Oa!” (light and dark runs with orange, passion fruit, guava and grapefruit juices) or the “Shipwreck on the Rocks” (bourbon, lemon, mint and organic agave nectar). Live music performed on the patio in the evening adds to the fun environment. For families or individuals preferring a high degree of service, the Disneyland Hotel features concierge-level rooms with upgraded in-room amenities and complimentary access to the exclusive concierge lounge. Meetings are easily accommodated within the hotel’s 136,000-square-feet of function space, and a business center provides a variety of services. Capturing the spirit of early California through inspiring design and daring architecture, Disney’s Grand Californian Hotel & Spa is a deluxe 948-room resort hotel property, offering a premium option for business or pleasure visits to the Disneyland Resort. This AAA Four Diamond hotel is the first Disney resort hotel in the world to be located inside a theme park – Disney California Adventure – making stays at the deluxe hotel a uniquely themed experience. The Grand also is home to the first Disney Vacation Club Villas on the West Coast. Among the deluxe guestrooms are standard rooms, artisan suites, two vice presidential suites and two presidential suites. In addition, the Resort offers more than 20,000 square feet of meeting and banquet space, ranging from the 12,000-square-foot Sequoia ballroom to smaller conference rooms and a sophisticated boardroom. The deluxe hotel features 24-hour room service, its own entry gate into Disney California Adventure, and rooms that overlook both the theme park and the exciting Downtown Disney District. For corporate meeting guests, the hotel features meeting planner offices, a business center and separate meetings and conventions check-in facilities. Food and beverage facilities include the AAA Four Diamond restaurant Napa Rose, as well as Storytellers Cafe and Hearthstone Lounge. Guests will enjoy two heated pools and a themed water slide, two whirlpools, a children’s pool, and a concierge level with upgraded amenities and services. Guests return to the heyday of California beachfront boardwalks at Disney’s Paradise Pier Hotel. Loaded with special Disney touches, this seaside-themed hotel overlooks Paradise Pier, one of the most colorful sections of the Disney California Adventure, making its name and theme a natural fit. This hotel offers charming facilities and superb service, with a fun California beachfront theme including recently remodeled seaside-themed rooms. The hotel is festively painted and decorated to reflect the theme, and some guests enjoy a view of the colorful Paradise Pier district of the park right from their room, along with the “World of Color” nighttime water spectacular. Disney’s Paradise Pier Hotel takes pride in being one of the finest hotels in its class. The 15-story, high-rise structure features 481 guest rooms, including remodeled suites and a recently renovated rooftop pool and whirlpool, a fitness center, lobby bar and coffeehouse, poolside bar, gift shops and game arcade. In Disney’s PCH Grill, guests can take a trip along California’s famous Pacific Coast Highway (PCH), for a celebration of the state’s culinary diversity and fresh spirit. Offered daily, “Surf’s Up! Breakfast with Mickey & Friends,” is a lively character dining experience where families can snap photos, practice hula hooping and learn how to ride a wave with Mickey Mouse and other favorite Disney characters.